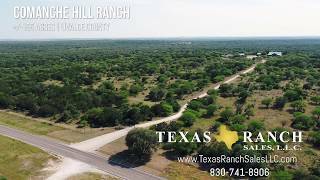 The Comanche Hill Ranch, 155 acre ranch for sale located approximately 11 miles south of Utopia and less than one and one-half hours from San Antonio. This South Texas ranch for sale in Uvalde County, Texas is an ideal turn-key hunting operation, permanent residence, corporate retreat, or weekend getaway. The terrain of the ranch is gently rolling with the home, studio, and barn at the highest elevation, allowing for outstanding views of the surrounding Hill Country. Live Oak is plentiful on the ranch with a scattering of Cedar and Mesquite. Huisache, Prickly Pear, Cat Claw and Acacia are also present. The ranch has abundant forage for wildlife and livestock with open pastures of native grasses and some dense brush. Comanche Hill Ranch includes a herd of 80 genetically improved Whitetail Deer, 60 bucks and 20 doe. Bucks range from 180 to 200 class deer. There are also eight Axis bucks and two doe. Native game on the ranch includes turkey, dove, and bobcat. The entire ranch is high fenced and there are two high fenced deer pens each consisting of approximately one and one-half acres with troughs and one darting blind. There is a three-acre, high fenced field perfect for planting oats or winter wheat. There is one Edwards water well that supplies water to a nine-stage sprinkler system, two troughs, the deer pens, the pond, and the home. In addition to the well, the main home is supplied by water from a self-sustaining Rain Water Harvest System. It consists of four 6,000-gallon tanks fed to the home via a booster pump and sophisticated filtration system. There is a drilled Trinity water well that is not currently in use located in the three-acre field. One pond on the property is approximately 20 feet deep, sealed with 18 inches of clay, and stocked with Channel Catfish and Bluegill Perch. Comanche Hill Ranch has a beautiful rock and knotty Pine main home of 3,313 square feet with three bedroom and four bathrooms. The home features a spacious open floor plan with 19-foot ceilings in the great room above a massive rock wall and fireplace. The home is surrounded by attractive, well-manicured landscaping within a three-acre fenced yard with its own electric gated entry. Behind the home is a fantastic 400 square foot entertainment area with a fire pit, swimming pool with water feature, garden, and a covered outdoor kitchen with a bar. A two-car carport is connected to the home by a breezeway. Nearby is a 24x40 climate controlled metal studio building with a large open area inside. It includes a kitchenette, bath, and Murphy bed. Across the parking area from the main home is a metal building with a three-bay covered shed on one end and a 1,080 square foot barndominium on the other. The barndominium has two bedrooms and one bathroom, a laundry and utility room, full kitchen, and living area. The barn also has a large game cleaning area, rock smokehouse, and a portable metal carport for implement storage.